Chronic neck and back pain resulting from multiple motor vehicle accidents introduced me to chiropractic care and massage therapy. I found much needed pain relief from all of the co-ordinated therapy. From that experience, I decided to change my own path to help others as well. I graduated from Makami College as a fully licensed RMT and have been practicing for the past two years now. 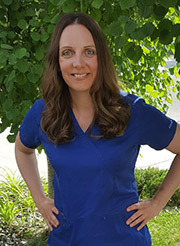 In making the decision of a career change, I have found passion in helping others and teaching others the benefits of regular massage therapy in relieving muscle tension and pain relief. Being a massage therapist is very rewarding and one of the best decisions that I have made for myself! Call our Southside Edmonton chiropractic office today to find out how Pamela can help you!